Makes me so happy to see Love in action! They delight the heart 💝 to love! I took them on a little shopping spree this week and the mall turned into a sharing of love. They are great communicators. Gladly and freely show happiness. And, very grateful to have an out reached hand to pat them on the head and/or give a tiny treat. Languages have no barriers in the ears of animals. That’s my belief. 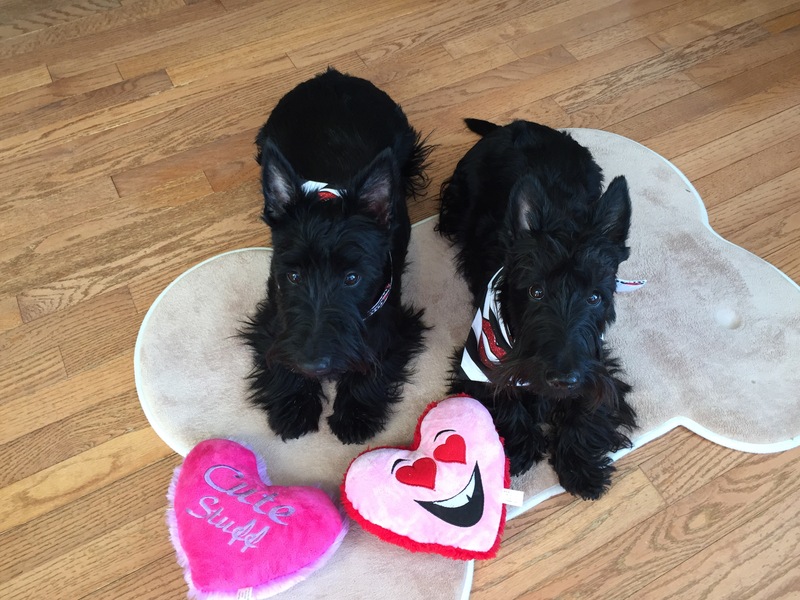 What a priceless pose from Boonie and Rocket …I think their Valentine hearts is a great match with their eyes and expressions. Thank you Sara for sharing the photos, your thoughts and your blessing. Tammy, you being a Mother of twins understand how a Mother knows her child, twin or not! 💞 They are about 2 weeks difference in age. They have different Mothers but same Father. (I know there are other titles for doggie families) But, they are our family now! 💜 Rocket, the older is the smaller, about 16 lbs. Bonnie, our princess is about 21 lbs. They are very, very different and easy to ID from their coat, eyes, sizes and drastically different personalities. So full of love, compassion and will offer surprises each day! “Until he extends his circle of compassion to include all living things, man will not himself find peace. Albert Schweitzer”. Debi, Albert Schweitzer, one of my mentors for living has always fascinated me with words that showed my lack of compassion. When I first heard this quote, I thought how I treat others, yes, animals, yes, and plants/trees. I,then started trying to save every twig on the list of dying to live. I had to come to understand and still trying to understand the awesome mountain called dying to live is real compassion. Jesus is the epitome of compassion. He shares His life freely with us to learn and grow. Thanks for sharing your insight and thoughts on this quote…much food to consider.